Neurobion, the nerve care expert from Merck Inc. Philippines, is at the forefront of the fight against Neuropathy and intensifies its efforts to drive awareness on the condition with three interactive, life-size art installations, all currently located in Glorietta, Makati City. 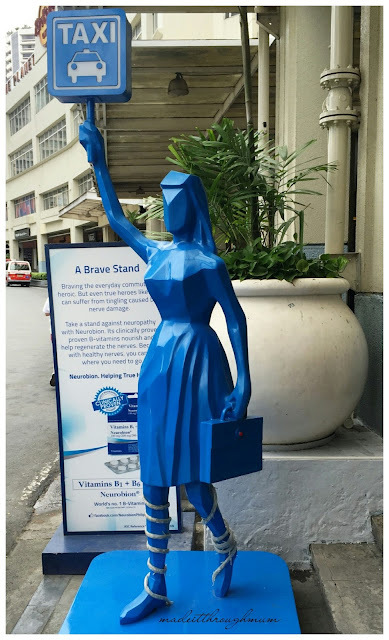 The installations serve not only as tributes to today's true Filipino heroes, but also reminders for them to care for their nerves the way they would for other parts of their body so they can keep on making ordinary acts extraordinary for ones they love. The installations dramatize the physical discomforts brought about by some of the most common symptoms of Neuropathy: numbness, tingling, and muscle weakness. "A Brave Stand" highlights the ‘pins and needles' symptom on the leg, changing lights from red to yellow to indicate unhealthy and healthy nerves. It also serves as a functional piece for our true heroes who are in need of public transport by simply pressing a button to light up the taxi signage that will notify taxi drivers to go to that area. "Motherhood" shows a simple loving act of mother to her child but with an interesting twist. 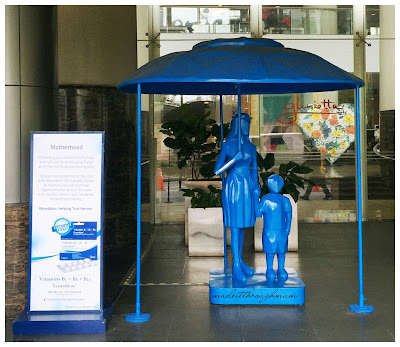 To educate the public about Neuropathy, the right arm of the mother holding the giant umbrella shows a cross section of the nerves which glows to depict numbness.This piece serves as a shade where families can feel ensconcedfrom the rain while waiting for their ride hom e.
"Supportive Hands" is a three-seater bench that is designed to yield with weight to dramatize muscle weakness. Come and visit these one-of-a-kind installations with the true heroes of your family. For more information on Neurobion, visit www.facebook.com/NeurobionPH .